No one would consider our family to be sports enthusiasts or even exercise enthusiasts. But the kids need to learn to ride a bike, right? It’s a basic life skill, isn’t it? 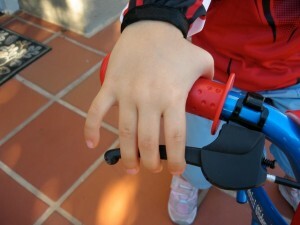 Our 5-year-old daughter had been using training wheels for about two years. She just couldn’t find that sense of balance and was very afraid to lose those training wheels. She wasn’t particularly adept at balancing on her 2-wheel scooter, either. Enter that cute little Pink Mini Glider. The thing is magic. I am not kidding. She practiced on it maybe six times over the course of six weeks. One day I was coming home from running errands, and my husband told me he had seen our daughter coast down the driveway and into the court with a big smile on her face. I told him, “Take off the training wheels now! She’s ready.” She started to whimper, but we told her we knew she was ready. She sat on her 2-wheel bike and rode it. All afternoon she rode it. Need I say more? The Glide Bike is a two-wheeled bicycle without pedals. Children propel forward using their feet to push off the ground and coast, gaining practice in balance and coordination needed to ride a traditional two-wheeled bicycle. The frame is lightweight metal alloy, has a low center of gravity and optional feet rests. It has BMX-style handlebars for ergonomic seating position. The handlebars and seat are adjustable. It has one hand brake. The tires are foam and do not require pumping and therefore are never at risk for flats. Go Glider has 16” wheels whereas its smaller counterpart, Mini Glider is meant for smaller children and has 12” wheels. This balance bike is created for 5- to 10-year-olds who are still working to perfect the art and balance of bike riding. It does not have training wheels or pedals, and is outfitted with 16″ EVA foam tires and an adjustable seat and handlebars. A 7-year-old girl who tested out the Pink Go Glider had a blast, commenting that, “It´s like a scooter but more fun.” She had a very easy time navigating the bike and learning how to ride it. She felt very safe on the Go Glider, too, except when riding downhill; she thought she might have more control over a regular bike in that situation. Her younger sister, 4, had a harder time riding the bike but enjoyed it, nonetheless, as long as someone was around to supervise. [There´s also a Mini Glider for ages 2 to 5.] The bike´s strong, sturdy quality speaks for itself, as does its potential for fun! It does, however, carry a higher price-point than some balance and traditional bikes. 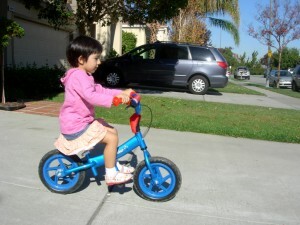 Very effective learning balance bike; safe; good stability because of mountain bike geometry and lower center of balance; easy to adjust seat height; handbrake; foot pegs help child get used to placing feet where pedals are on traditional bike. My 8 year old loves her Go Glider and chooses it over her regular bike, because it’s so much fun to glide! I highly recommend Glide Bikes to all parents for a no-tears, no fears way for children to learn balance the right and fun way (without training wheels). The learning process is quick, but the shelf life of the Go Glider is long, because of the fun factor. Some people say that nothing is perfect. But if there was a perfect balance bike, the Mini Glider would be the most likely candidate. You’ll like its high quality. And you’ll also like how the manufacturer payed attention to details. The quick release, tool free seat adjustment is more than welcome. 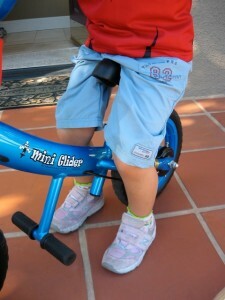 And unlike other training/balance bikes, the foot peg and brakes are standard features of the Mini Glider. To keep from disorienting (and possibly injuring) our little ones, the Mini Glider has a steering limit. Also for safety purposes, this balance bike has a rear wheel brake only. The brake lever is on the right-hand side of the handlebars. Also, the height of the handlebars can be adjusted. The Mini Glider weighs only 8 pounds (3.6 Kg), which makes it very easy for our kids to maneuver, and even lift the bike without the risk of injury. And at a certain age, even carrying it won’t be a problem. The light weight of the Mini Glider also means that you pay less for shipping. And after you receive the bike, it’s very easy to assemble. The tool is included in the box, so you don’t have to worry about having the right tool for the job. Currently, the Mini Glider balance bike is available in three colors: blue, pink and red. 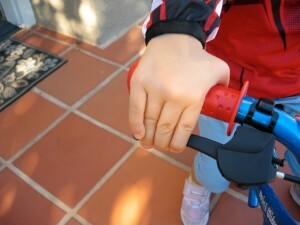 Teaching your kids how to ride a bike can be one very challenging and rewarding activity. The traditional approach is put your kid on a regular bike with training wheels and then at a certain point a difficult transition needs to happen: taking the training wheels off. More recently a different approach has become more popular, the so called balance bikes: basically a little bike with no pedals and no training wheels. 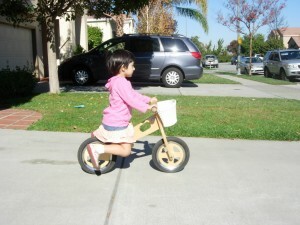 Both feet are comfortably placed on the ground and initially the little one can just walk around on the little bike. This allows a much more gradual and smooth transition to balancing and steering the bike. 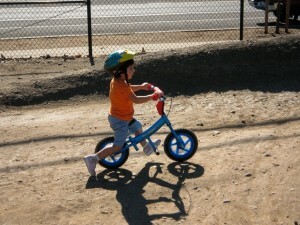 The little rider never gets used to a self standing bike and learn to deal with balance right away. Very quickly the balancing becomes walking, then running and coasting. At that point the only step left is adding the pedaling, which possibly has been learned previously on a tricycle. The PV Mini Glider has many features that make learning to ride easy and fun. It is designed for kids age 2-5 while the bigger model Go Glider is designed for kids age 5-9. The Mini Glider has a sturdy but light aluminum frame, with 12″ rubber wheels, adjustable seat post and handlebar height and rear brake. The bike weighs 8.6lb, a little less than a wooden bike (around 9lb) and less than half of a regular 12″ toddler bike (yes, that’s 18lb). The light weight is one important feature, since it allows the little rider to easily move the bike around: very often kids bikes of this size (10-12″ wheels) are extrelemey heavy, especially considering the small size of the rider. There are several features to enhance safety: the handlebar and stem have padding to protect from direct impact, the slack head angle guarantees a stable ride and avoids dangerous endos, the rear brake only and the limited steering angle help also avoiding crashes. The seat is ergonomic and relatively soft: this is another pro compared to the wooden bikes, where the seat is generally pretty uncomfortable and can even cause saddle sores on long days on the bike. The seat post has a quick release and is easily adjusted. The rear brake has a little lever, suitable for little hands, and the reach of the lever is adjustable: the advantage compared to coaster brakes is that the kid gets familiar with lever brakes, avoiding to have to learn that skill later when transitioning to a bigger bike. The little 12″ tires are made of EVA foam and have no tube or air in them. This makes the bike overall lighter and require less maintenance (no flats, no need to inflate tires). My 3 1/2 old daughter test rode the Mini Glider. Handlebar position and seat were easily adjusted to fit her. She’s already learned to balance on a Skuut wooden bike, so the transition to this one was very easy and she was rolling in a second. The presence of the brake gave her more confidence (as was not present on the Skuut), but at the end of the first day she was still braking mainly a-la Flintstones. The foot rest is a very nice addition, not initially when they just walk around on the bike (is actually a little bit in the way) but when they learn to coast downhill: having someplace where to rest your feet helps and improves also stability. On the other hand the foot rest limits somehow the clearance, not really a problem, until they start to tackle sidewalk curbs. After few rides the little rider will start to keep one foot on the rest while pushing with the other one. The slack head angle makes for a very stable ride while the steering radius is limited also helping to limit or avoid crashing: in other words the handlebar will turn only to about 30 degrees. Glide Bikes has just released a Hot Pink version of the Mini Glider, that would definitely appeal better to young female riders.